Andrew Gilliatt grew up in Virginia Beach, VA. He graduated with a BFA in Graphic Design from Virginia Tech in 2003. Later, he was a resident artist at Red Star Studios in Kansas City, MO. 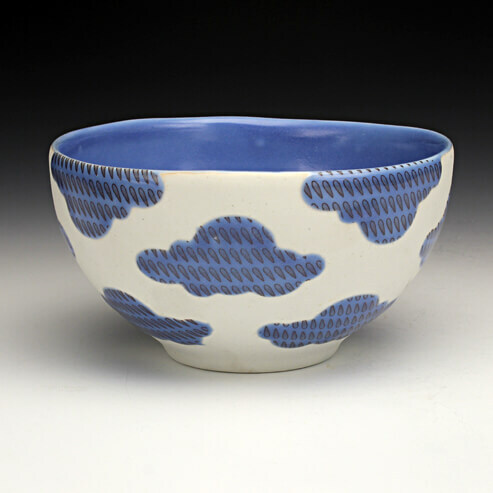 Andrew just recently, in the spring of 2011, received his MFA in Ceramics from Louisiana State University. He is currently a summer resident at the Archie Bray Foundation in Helena, MT. In September 2011 he begins a year-long residency at Red Lodge Clay Center in Red Lodge, MT. With my functional pottery, I am designing and fabricating objects with the intent to create visibly dynamic forms that with the use of color and imagery are expressive, visually inviting, and easily accessible as objects for domestic use. My aim is to create a body of work that is, in fact, cohesive in its variety. My hope is that by doing so, I can make pots that you identify with and want to own. I am fascinated how we personalize and define ourselves through the objects we use and accumulate. The clothes we wear, the cars we drive, the things we decorate and furnish our homes with – all of these objects reflect our personality and aesthetic proclivities both publicly and privately. I am interested in the phenomenon of how we look and shop for objects. Once the requirements of fit, occasion, and agency have all been established, (a size 11 running shoe that wears comfortably, for example), to what degree are we further attracted to the point of purchase? Is it the pattern of the shirt, the cut of the dress, or the color of the shoe that makes us want to own that object, or is it simply a matter of cost and convenience? This avenue of inquiry has led me to specific changes in how I approach the use of color, imagery, pattern, and form.